That’s one of the notes I jotted down last night while watching a PBS special on W.S. Merwin. Merwin is the U.S. Poet Laureate, who lives a few miles away, in Haiku, on Maui. I first heard him speak a few years ago at a symposium at Iao Theatre in Wailuku. He exuded quiet and stillness, even while reading his poems. While I do not recall the poems, I remember that he wrote about valleys in Hawaii, and how different valleys had different names and different weather patterns that no one remembers anymore. When I found out that Merwin was appointed the poet laureate, and lived here on Maui, my mouth fell open. Imagine that! It’s as if Shakespeare or Robert Frost was living in a secret corner of Maui. When Merwin talked about wide margins for writing, he was referring to having space in one’s life… space for thinking and experiencing, space for not doing anything in particular - not adding items to one’s to do list. Merwin’s life ran a different path from his contemporaries. His friends from Princeton were talking about getting jobs after college, and then moving on to other jobs, and Merwin said he did not want that for his life, to move from situation to situation. He wanted to experience living in different places and to focus on his writing. He did not feel a call towards academia either, because he did not want to climb the academic ladder, saying it was not right for him, however right it was for other people. Instead, he took odd jobs including translating poetry from other languages and tutoring in Spain. Eventually, he moved to Hawaii, thirty five years ago. I’m intrigued with W.S. Merwin because he chose the road less travelled by, although he did not know where his life would lead. He and his wife became avid gardeners, dedicated to saving endangered palm species. Their land has recently been made into a trust, the Merwin Conservancy, so that their plant-saving legacy can continue. In part, although he is reclusive, he accepted the position of poet laureate so that he could publicly express his ideas about changing our relationship to the earth, and he didn’t want to die before having shared that. The program on PBS, “A Conversation with America’s Poet Laureate: W.S. Merwin” first aired in February 2011, but will be repeated from time to time, as it was last night. W.S. Merwin had several anecdotes and gems to share, some of which also related to his appreciation of Hawaiian culture. One reflection referred to his retelling of a true Hawaiian story about a man diagnosed with leprosy, who fled the authorities and took his family to the fabled valley of Kalalau on Kauai. This became The Folding Cliffs. 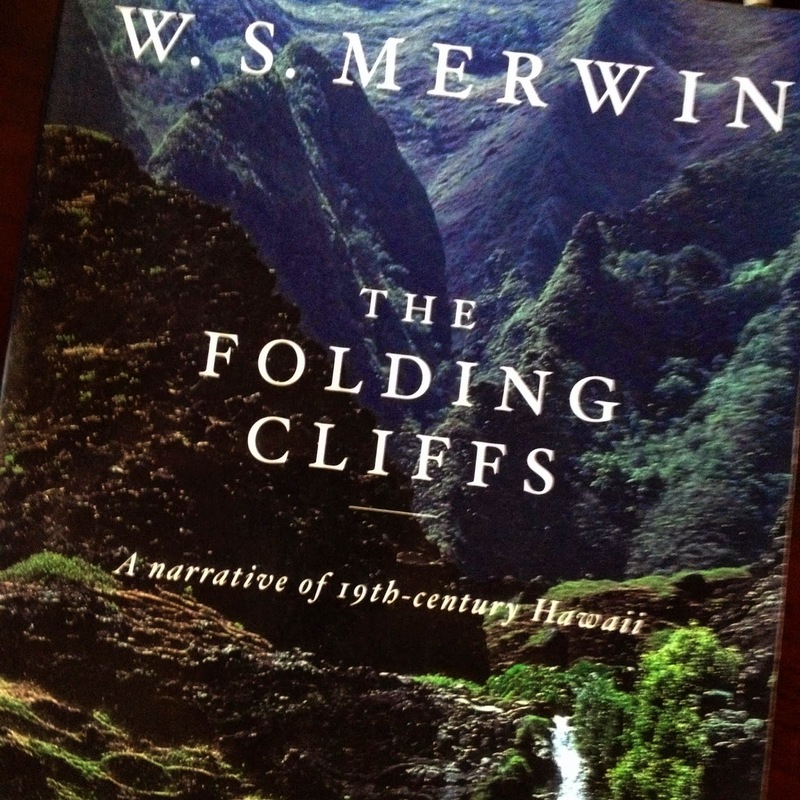 My copy of The Folding Cliffs. You can find it at the library, a bookstore (rarer these days) or on Amazon. It’s a story that I didn’t grow up hearing, but only heard when I moved to Kauai. Merwin says that it’s a story that rightly ought to be told by the Hawaiians, and he is not Hawaiian, and had much hesitation about telling this story – at least 10 years’ worth, but the story haunted him so much, he eventually wrote a narrative poem about it. I am so impressed by Merwin’s careful choice of words and phrasing as he talks about his life path and the path of others, without judgment, and I’m not sure if I am conveying that as clearly as he did in the interview. Merwin also said something to the effect that each moment, if we pay attention to it, contains the whole of our past and all of our life embedded in it. Once in a great while, we pay attention to these moments and become very awake, but the rest of the time, we are not aware. Poetry to Merwin, is about trying to express the inexpressible. The pure experience of something. Art is about recognition, recognizing something in art that is reflected in ourselves. He said that Shakespeare’s sonnets don’t reveal much about Shakespeare’s love life, but reveal a lot about one’s own personal love life. Each time we read something, we get something different out of it, since a different part of us responds to the work depending on what is going on in our lives. I highly recommend watching this program, next time it broadcasts. In the meantime, I found an excellent link to a video interview with Merwin, via the Kenyon Review, a poetry publication, plus a very interesting – Maui Jungalow style - essay that Merwin wrote about the history, building, and reclaiming of his land into a palm conservancy. Although I did subscribe to the email newsletter for the conservancy, I have not heard any news from them, except the welcome email, several months ago. Apparently, they offer bi-monthly garden tours, and I hope to go on one soon. Update 7/15/14: W.S. Merwin retired from being US Poet Laureate, though he does occasionally speak in public. And I got to meet him last month at the Maui Film Festival during a showing of the film Even Though The Whole World Is Burning, about W.S. Merwin's life and legacy.